B sure and make note of these runners. They showed some type of trouble, had a compromised trip, or look to be coming into their own. Best of luck ! Memory Keeper (AQU Race #4 – 3/5/16 – #4 – 6f) – He was sent off the post time favorite, and was in the hands of Jose Ortiz. – He looked fine from the break and Ortiz had to give him his cure early. he played chase, and ran an even 4th. He fits the “beaten favorite” angle and ran an even effort. Even though the race was uneventful, I think we’ll see a better run next up. He appeared to have his mind on something else this day. Dance Champion (AQU Race #5 – 3/5/16 – #4 – 6f) – Irad Ortiz had the call this day, and was involved in a three-way pinball bumping match. Ortiz swung him into the two path to get his bearings straight and went a bit too wide when the real running began. Another “beaten favorite” player, and punters from all walks love to get better value next trip to the races. Casiguapo (AQU Race #6 – 3/5/16 – #8 – 1 mile and 70 yards) – Kendrick Carmouche for trainer David Cannizzo, and this runner lost quite a bit of ground from the start. Jumpin Frac Flash jumped inward at the start, and squeezed back Casiguapo just as they sprung the latch. The part that caught my gambler’s eye was how well this runner got it all together and made a six wide bid. He didn’t lose interest on this day, and I won’t next time he goes to post. Jokasa (FG Race #3 – 3/5/16 – #2 – 5 1/2f on the turf) – underrated rider Cisco Torres had the assignment, and filly looked pretty sharp down the backstretch. Patiently handled and once Torres went to the stick she responded immediately. She showed good effort down the lane and looks like a solid play next up. 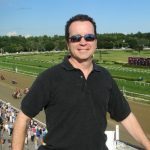 Hey Meestermeester (FG Race #4 – 3/5/16 – #3 -6f on the dirt) – Richard Eramia was the reins man, and his runner broke through the gate and ran a furlong prior to the start. Once they wrangled down the speedster and the vet looked him over. He loaded back into the starting gate. When the starter sprung the latch he broke awkwardly and spotted the field extra lengths. Eramia never pushed to get him back into action and wrapped up and saved it for another day. Thinking back, when he broke the gate and tossed the rider he looked like his tail was on fire. His speed will return next up and all he has to do is behave in the starting gate. Coming off a poor performance six weeks ago in a $10,000 starter handicap race, Bridge To Nowhere won the closing race at Aqueduct Saturday afternoon. Contestants ran the mixed conditions, one mile race for a tag of $10,000. The 5 year old, owned by Hedgebright Stables, was sixth at the quarter pole and rallied to eventually win by a half length under rider Ruben Silvera. Trained by Glenroy Brown, the gelding finished the mile in 139.71 and paid $9.80 to win. Bridge To Nowhere, who was sired by Well Noted, has now won 10 times, accumulated 23 in the money finishes from 36 lifetime starts and has career earnings of approximately $150,000. Six-year-old Fastus Cactus took the honor of Claimer of the Week with an impressive victory in the sixth race at Aqueduct Saturday afternoon. The winner paid $3.40 in the $7,500 claiming event. Fastus Cactus left the gate and owned the lead at the blink of an eye. The Cactus Ridge gelding took the field coast to coast with very limited urging from rider Irad Ortiz, Jr. 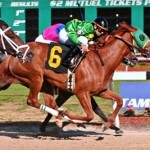 He completed the six furlongs in 111.64 and won by nearly three lengths. Trained by Bruce Levine and owned by Saul and Max Kupferberg, Fastus Cactus now has career earnings that exceed $240,000 from 29 starts. He has won 9 races and finished in the money 19 times. The speedy chestnut was claimed out of the race by Glenridge Stable and trainer Joseph L. Signore, Jr. It is the fourth time Fastus Cactus has been claimed in 7 months. Ezzy disposed of the goose eggs in his 2011 earnings box (5-0-0-0, $4,126) with an impressive performance in the sixth race at Aqueduct on Saturday, December 10th. Ezzy was ready to roll in his second race after a layoff, and the drop from $15,000 to a mixed condition race for $7,500 was just what the doctor ordered. Ezzy wasn’t the only class dropper in the field. His early speed proved an advantage over others as he captured the lead from the gate. Midway in the turn Ezzy disposed of a Monmouth shipper and opened up at the quarter pole when asked by apprentice Irad Ortiz, Jr. The 5 year old gelding dashed to the wire in a professional manner and was never threatened by the heavily backed favorite. Ezzy finished the six panels in 1:11 3/5. Trainer Rudy Rodriguez sharpened Ezzy and prepared him to run on the Inner Dirt at Big A with a solid half-mile breeze on that surface ten days before race day. The dark bay or brown gelding by Rizzi is owned by Linda S. Hayes. The winner paid $10.00 to win. A runner with a ton of back class, Ezzy’s career earnings now exceed $150,000 with five victories from 20 starts. Ezzy is the first ever recipient of the AGameofSkill.com Claimer of the Week.